122 St Michael’s Hill, Bristol BS2 8BU OPEN NOW! First bus group number 9 and 72 stop close by. The miso braised aubergine was one of the best things I’ve ever eaten. I went to the Vittoria for my Sunday roast today after seeing recommendations here. I was not disappointed. It was very good indeed and if I hadn’t wanted the roast there were plenty of delicious looking options on the menu. Will be going there again. Went there last week. GREAT food, friendly staff, good drinks choice. My only fault is that it’s too far from my house! The Vittoria. Omg it’s good! Went to the Vittoria and the food was amazing! Amazing lunch at the Vittoria on Whiteladies Rd today!! 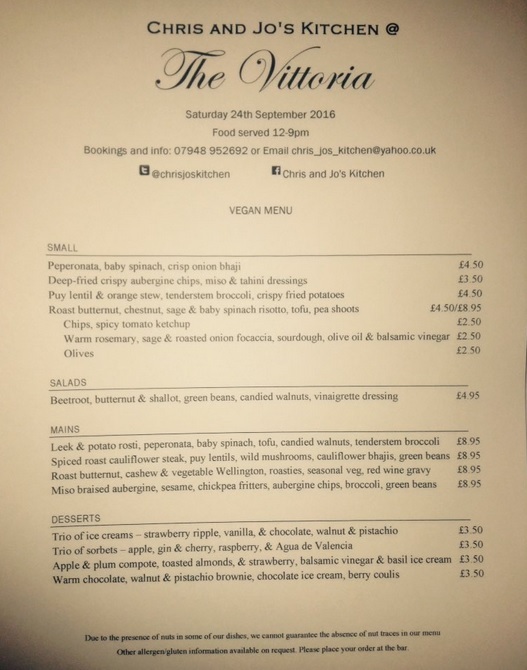 Loved our sunday roast so much at The Vittoria that we had to go back and try some of the other stuff on their vegan menu. Very impressed, lovely staff, great sized portions, reasonably priced and delicious! If you want top notch vegan grub in a pub this is the place! Can’t recommend highly enough. Definitely be coming back here again. Delicious and well presented pub grub, relaxed atmosphere and friendly staff. The purple sprouting broccoli, toasted almonds, lemon & tahini dressing; leek & potato rosti, ratatouille, spinach, tofu, candies walnuts; and raspberry sorbet, dairy free vanilla ice cream, fresh berries, & raspberry coulis are highly recommended.